….A national survey of jobless workers by a pair of professors at Rutgers University shows just how traumatized the work force has become in this downturn. Two-thirds of respondents said that they had become depressed. More than half said it was the first time they had ever lost a job, and 80 percent said there was little or no chance that they would be able to get their jobs back when the economy improves. ….It’s eerie to me how little attention this crisis is receiving. The poor seem to be completely out of the picture. It is kind of eerie, and I’ve noticed the difference in mood too. 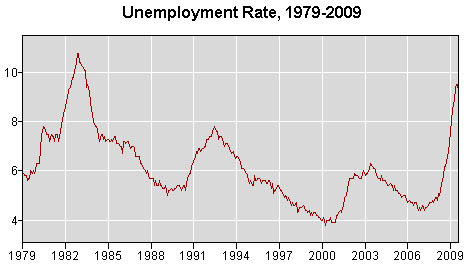 It’s true that the unemployment rate isn’t quite as high (yet) as it got in 1981-82, but it’s pretty damn close — and yet the tone of news coverage seems quite different. My recollection of the early 80s is of lots and lots of coverage of plant closures, homelessness, food banks, and a serious sense of panic and despair. This time, not so much. Has this been purely a difference in media coverage? A difference in the way unemployment is distributed? The fact that hard times have only been with us for about a year so far? A genuine difference in the way people are reacting? Or what? I really don’t know the answer. But yes, it feels quite different than it did in 1981. Help me out, fellow oldsters. Does it feel different to you too? Or am I just imagining this?